Renault Key Replacement Specialists in Bristol & Bath (& Surroundings) – We Come Out To You! Welcome to Lock City, we are Auto Locksmiths specialising in Renault Key / Card Replacement. Providing a fast roadside solution for lost Renault key situations … or maybe you just need a spare. 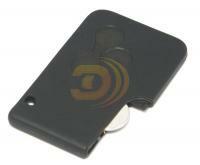 Just one example of the Renault Key Cards we keep in stock! Does Your Renault Use The Key Card System? Renault make two versions of cards, you can have either hands free (the car will start without inserting the card) or non hands free. Our roadside workshop can come to you (in our coverage area) and supply and programme the new key card. We get many calls from motorists to say they are getting the error message “key card not detected” – call us now to get expert advice! Or request a quote for a spare key card now! We Can Also Supply You with a Replacement Renault Card Reader! For the Renault Clio, Kangoo and Master vehicles there are two different types of remote key which are either pre-coded or Virgin. Both remote types must be bought new (will not work if it has been programmed to another vehicle). Pre-coded was used on pre-facelift Clio’s (1999 to 2001), Kangoo’s (1999 to 2002) and Master’s (1999 to 2003). Immobiliser Failure on Renault Clio, Master & Kangoo – There is a transponder chip on a circuit board just inside the key. We have experienced that the chip can easily break or becomes corrupt. We can test to see if a signal is being recieved from the transponder chip. If the card is damaged we can supply a new card and programme it to your vehicle – saving you a long wait with your dealer! Please complete our online form and we will get back to you with a quote. Button failure – We have found that the buttons can fail on these cards. You may have found sites on the web that advertise a repair service for Renault key cards. This option is fine if you are looking for a short term fix, but if not, it can be false economy. Many customers have found that after a while the repair fails – this is not due to the repaired buttons, but with the immobiliser chip (inside the card) which starts the car. Q) I have locked my keys inside my Renault! We offer a fast Renault door opening service with the aim of getting you back on the road again quickly! You can read more on our vehicle entry page. Q) My Renault key has broken off in the lock/ignition, can you help? Yes, we offer a fast broken key extraction service, and we can provide you with a new key so you can get on with your day! Q) Are you able to programme Renault car keys? Yes! We offer a mobile key programming or re-programming service using the latest in key coding technology. Q) I have bought a remote/Card from Ebay and have been told to get an Auto Locksmith to programme it, can you help? All Renault keys, remotes and cards bought on ebay have usually already been programmed to another car. If this is the case then it is not possible to programme it to a 2nd vehicle. Some cars require a pre-coded key to chassis number, whilst some cars require a virgin key/card. We can supply and programme your remote / card, please get a quote now!